The QAD Exodus broadhead is a 100% stainless steel fixed blade broadhead that is designed for accuracy and penetration. This made in America broadhead features B.O.S. or Blade Over Shaft technology which helps to create a short broadhead length resulting in arrows that will be the same length as ones tipped with field points. Let’s take a closer look at the features of this ultra-sharp broadhead. 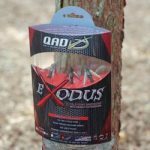 This is not something that we would normally cover in a broadhead review, but with the QAD Exodus broadhead’s packaging, we think it’s a must. The packaging is flawed and can result in finger cuts if certain steps aren’t taken to remove the product. QAD is aware of the packaging issue and is in the process of resolving the problem. The main take-aways from the video (in case you can’t watch it) is use finger protection and to unscrew the broadheads from the plastic instead of pulling on them. The initial impression of this broadhead is a good one for sure. 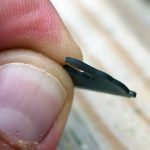 Once I removed the broadhead from the package, I noticed a couple things that are different than most broadheads: the chisel tip and the recessed blades. The chisel tip of this broadhead is unbelievably pointy and sharp. It’s almost like a Muzzy MX-3 and a Rage Hypodermic hooked up and had a kid. I have no doubt that the penetration path started by this chisel tip will never be a problem. Now for the blades. To compliment the excellent chisel tip, QAD incorporated 0.040 ” thick blades that are recessed over the shaft a little bit. This Blade Over Shaft Technology helps you to maintain the same arrow length which lets the arrow keep the same static spine it had when it had a field point installed resulting in excellent accuracy. The QAD Exodus broadhead is a short profile broadhead which will correct itself in flight quicker than longer heads. You’ll notice that if your bow is tuned properly, the QAD Exodus broadhead will fly the same as a field point. The cut on the Exodus broadhead is a very respectable 1-1/4 inches. This is the cutting diameter on the 100 and 125 grain models regardless if swept or full in design, for compound or crossbow. Even at this cutting diameter, QAD still delivers on a steep cutting angle for excellent penetration. When purchasing the QAD Exodus broadheads, you’ll be given the option between weights (85, 100, and 125 grains) and the style of blade (swept or full blades). The two different blade designs offer the same diameter cuts, but vary in resistance to the wind. The swept blade has less blade area and should help the arrow stabilize quicker in flight. The swept blade design will lead to increased accuracy, but they may be considered a “barbed” arrow tip and may be illegal in certain states. Check with your state’s broadhead laws to see if the full or swept design is your best option. We give the overall build of the QAD Exodus Broadheads a 4.8 out of 5 stars. We individually weighed 9 total QAD Exodus broadheads. The 3 styles we weighed were the 100 grain swept, 100 grain full, and 125 grain full crossbow versions. Of the 9 broadheads that we measured, on average, each broadhead was off it’s advertised weight by a grain or two. While not the tightest tolerances we have seen in a weigh-in, they are well within the +/- 3% that is typically acceptable. Having heads that are off a grain or two also allows for matching with uneven shaft weights. We give the consistency in weights of these heads a score of 3.5 out of 5 stars. These blades are thick and sharp. These blades will cut and these blades will kill. The 0.040″ blade thickness is by far thicker than most of the fixed blade broadheads on the market. This thick blade in combination with the unbelievably sharp chisel tip is one hell of a combination that is going to take down any big game animal that gets in it’s way. Here are a couple of pictures that will show you exactly how thick and how sharp these blades are. We give these blades a sharpness score of 4.9 out of 5 stars and a durability score of 4.8 out of 5 stars. The blades of the Exodus broadhead are easily replaced by removing and O-Ring and blade retainment collar. Once those components are removed, just slide the old blades out and the new blades in. Nothing to it really. 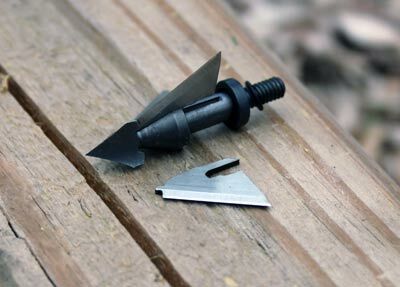 This broadhead is one hell of a tough and sharp broadhead. While the packaging leaves a bit to be desired, this broadhead will deliver on accuracy, sharpness and durability. 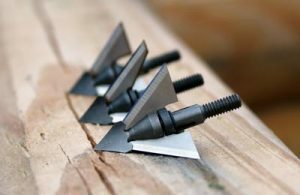 In our opinion, if you shoot a fixed blade broadhead, you definitely should give this one a look. For more information, give the QAD website a visit at http://www.qadinc.com/broadheads/.